The first time I was made aware of Lady Gonzalez was as I visited Colab in Bristol. I really liked the bright teeth mugs and the bright gold/silver chained mouth/teeth necklaces. 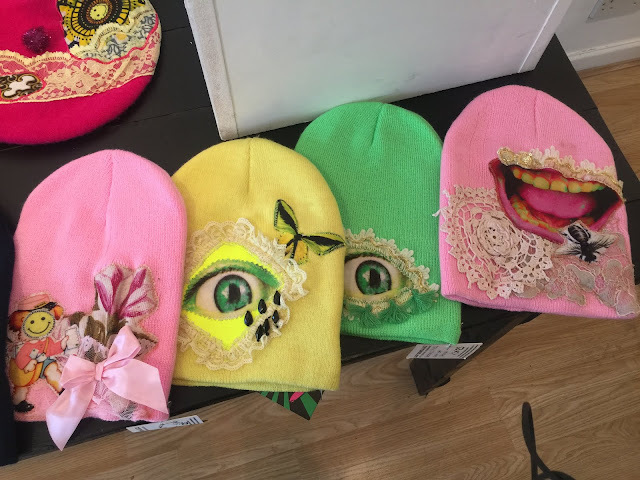 The bright trippy patterns of eyes, scales and brains alongside leopard print/bling vibes was so exciting and immediately stood out to me, I wanted everything. “LADY GONZALEZ is a unique textile-design based Fashion and Lifestyle brand, officially launched in 2013 by the artist Celia Arias-Gonzalez, currently living and working between the cities of Bristol and London (UK). Celia was born in Barcelona and raised in Madrid (Spain). 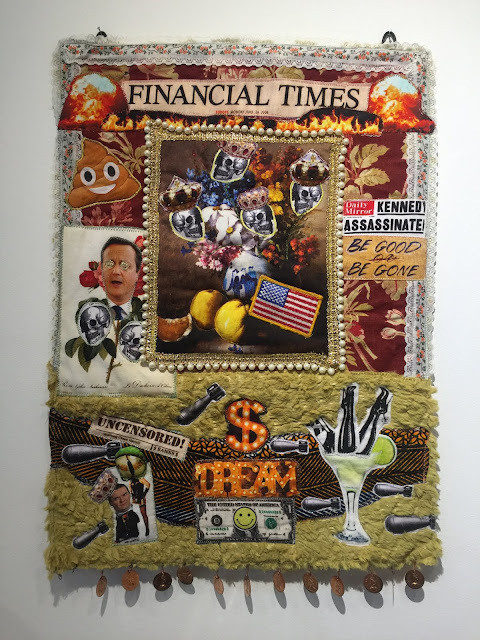 She moved to London in 2001, where she combined working as a freelance fashion stylist with an apprenticeship at the costume house, Prangsta Costumiers, going on to complete a BA in Fine Art Textiles at Goldsmiths University of London." 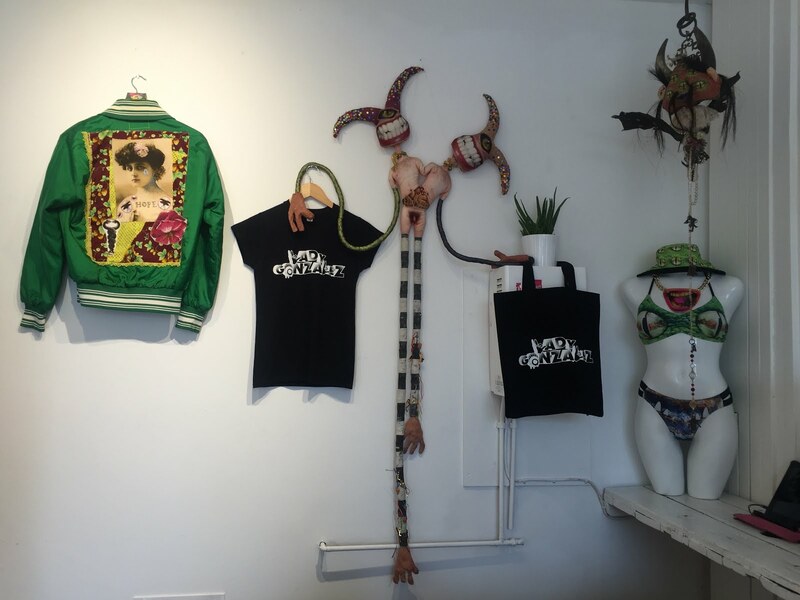 Words by Morwena James on Lady Gonzalez World website. At some point I heard that Lady Gonzalez World was doing a pop-up shop somewhere in Bristol soon so I kept an eye out for more details. 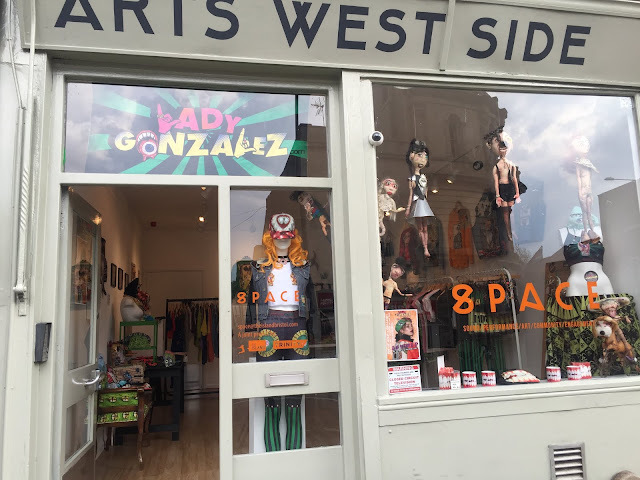 Then during a stop at Biblos for a jerk chicken wrap (yum), I noticed a brightly colourful flyer and I knew it was Lady Gonzalez. 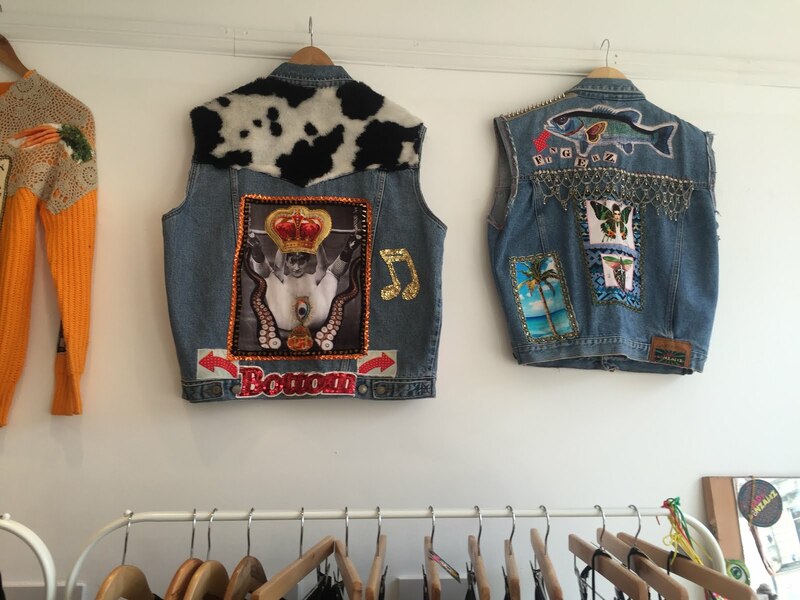 The weekend the pop up shop launched I was in Bristol and had time to explore and go check it out. 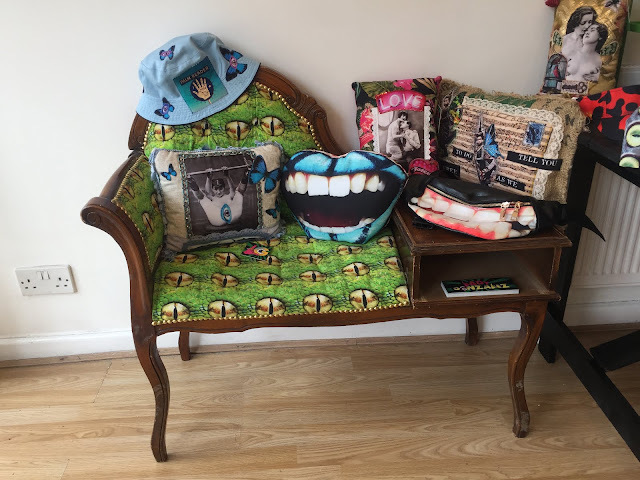 I walked into town and after browsing a huge vintage shop in Stokes Croft I wondered over to Old Market using maps on my phone to find SPACE, where the pop up shop was. SPACE (Sound-Performance-Art-Community-Engagement) at Arts West Side, 6 West Street is a newly opened hub by The Island Bristol to be used as a welcoming space for the creative community in Bristol where they can showcase their work and share ideas. 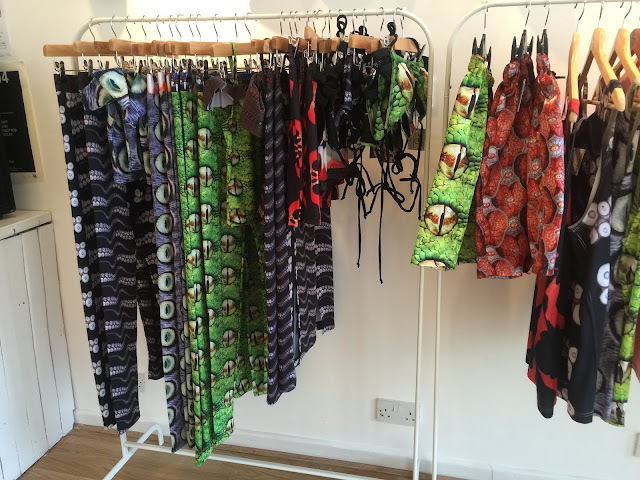 I walked in and after a warm welcome from Celia Arias-Gonzalez herself, she kindly showed me around the room pointing out different designs from her new and previous collections. It was so nice to speak with her and hear her talk about the designs a little, she kindly described some of the wacky wall hanging creations to me as I drifted around the room making “woooow” and “cooool” comments more than a few times. Also, can we just appreciate this incredible 'Financial Times' flaming wall art for a second. Lady Gonzalez is amazing! 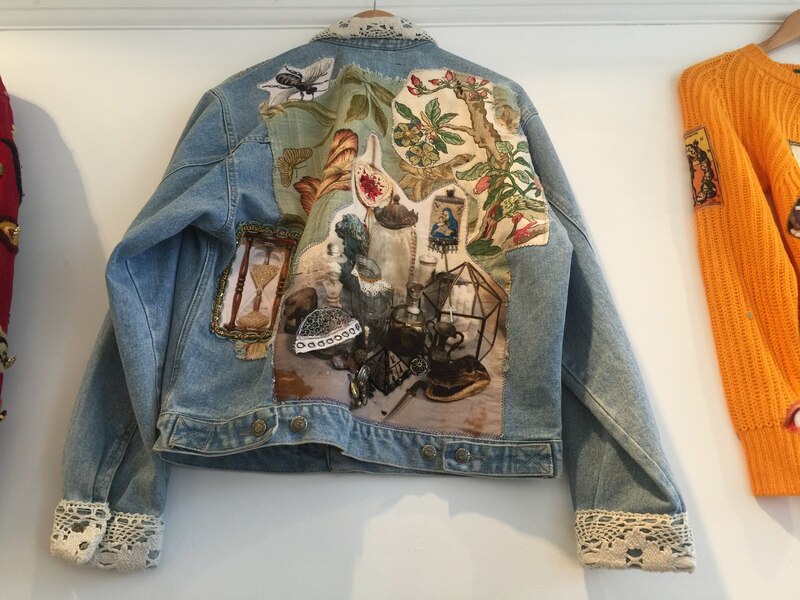 I love everything! 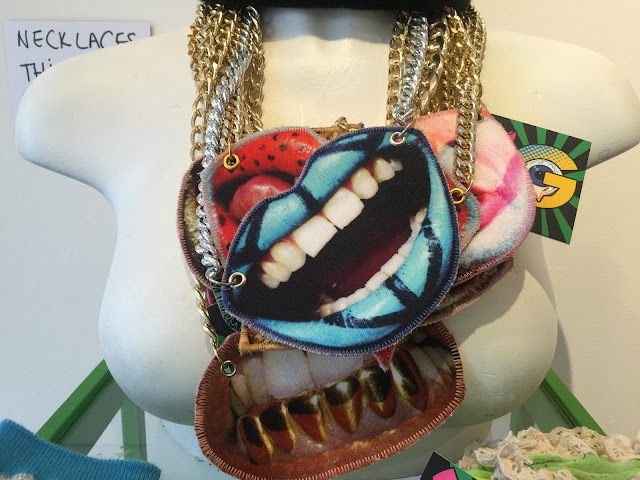 Her clothes are bursting with brains and lizard eyeballs and mouths and teeth and bliiiing. ‘Neosurrealism’ is a word I have seen associated with Lady Gonzalez and I love this, it seems perfect. I got cash out at the ATM across the street and went back inside to take on the decision making of what to buy as I struggled to narrow it down to one thing. With the intention of buying more LGW items in the future, I left with one of the COOOOLEST necklaces I have ever seen. That’s the blue mouth emblem on the silver chain seen in the photo. 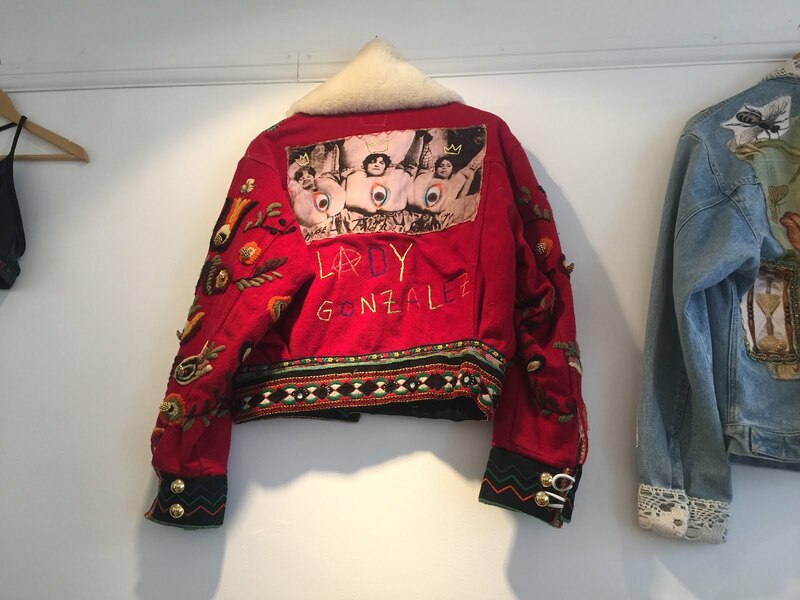 I really really wanted one of the ‘one-off’ customised Lady Gonzalez jackets from the selection on display across some of the walls but I just could not pick one! 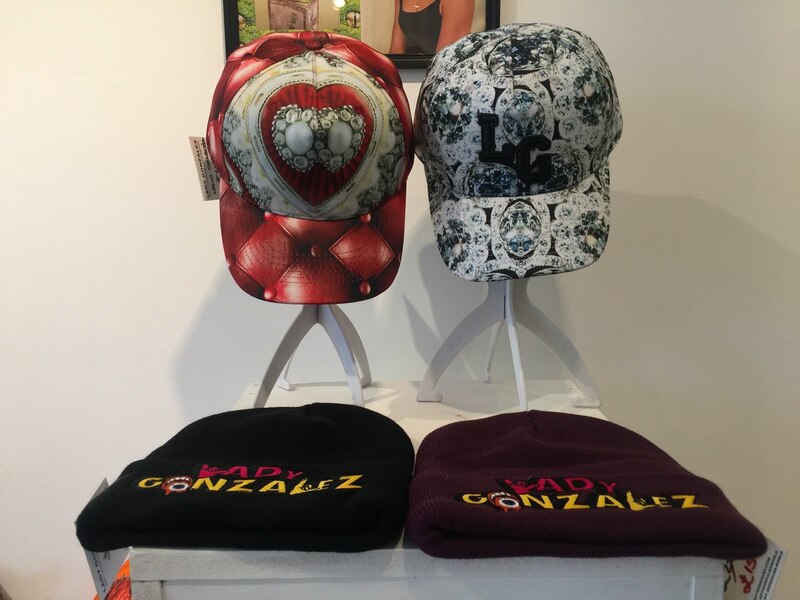 The Lady Gonzalez World pop-up shop at SPACE is over now but you can see Lady Gonzalez World shop online here. 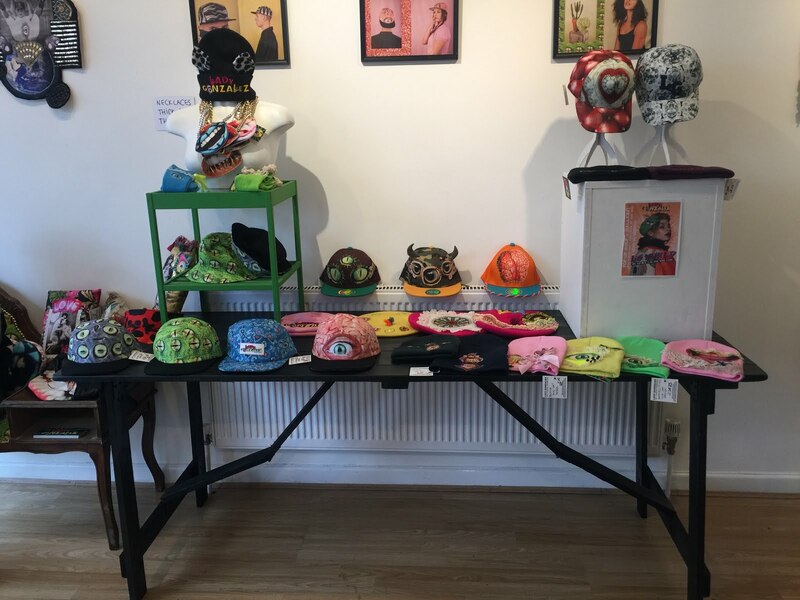 Or if you are in Bristol, stop by Colab. 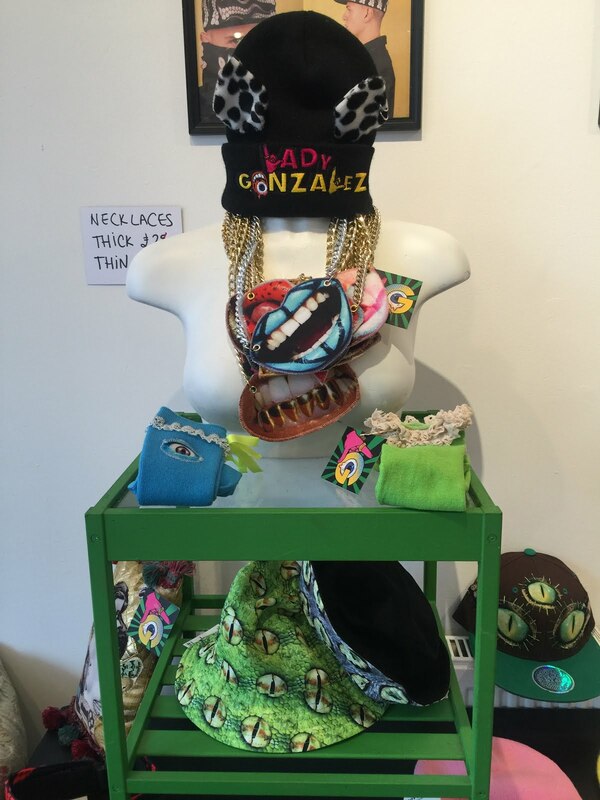 Hopefully next time I will make it to the launch/opening of a Lady Gonzalez pop-up shop. 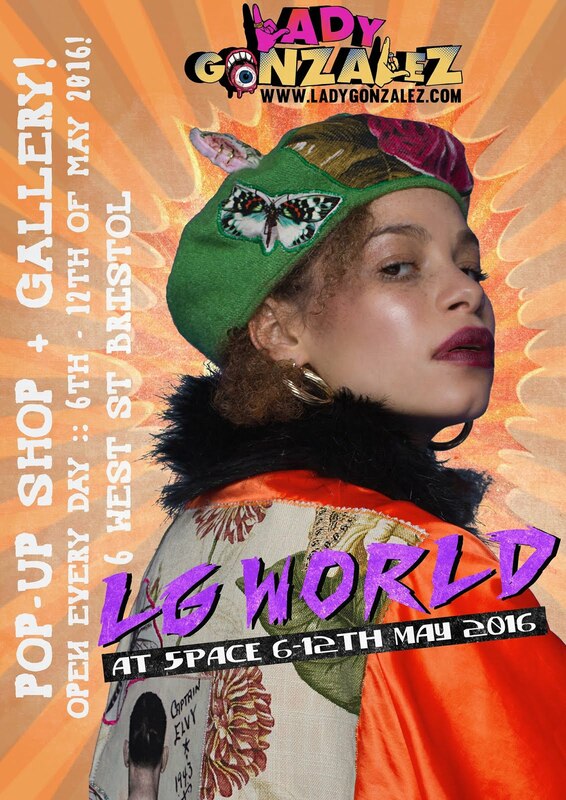 Look out for her super cool stuffs in Bristol and London! All photos are my own unless stated otherwise, please credit if you want to use them, or ask my permission. Thank you.